(Newser) – Stocks posted solid gains Monday, adding to last month's big advances and pushing the Dow Jones industrial average into positive territory for 2015. Several companies moved on news, including Chipotle Mexican Grill, and Visa. Health care stocks were among the winners as drugmakers Pfizer and AbbVie climbed, while energy stocks rose sharply in a late-day rally. 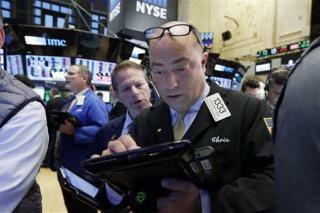 The Dow Jones industrial average rose 165.22 points, or 0.9%, to 17,828.76. The gain made the Dow the last of the three major US market indexes to return to positive territory for 2015. Sounds like peace and prosperity.